Have you ever had these thoughts that maybe the writers of the Bible have got some things wrong? For sometimes what we read doesn’t seem to make much sense. For example, listen to this, this is from Psalm 1. “Blessed is the man [whose] delight is in the law of the LORD, and on his law he meditates day and night.” (Ps. 1:1-2) Does this sound right to you? Someone who delights in the law of the Lord, not in the Gospel, but in the Law, and meditates on it day and night. What do you think? Have they got it right? Haven’t we heard again and again that the Law, that is, the Commandments, show our … yes, our sins. The Law condemns. Others keep saying that the Law is bad, and the Gospel is good. That the Gospel has freed us from the Law and now we are free from it. Before Jesus there was the Law, and now instead of the Law we have love. Just love one another, and that’s enough. But here we have psalmist, led by the Holy Spirit speaking of the Law of God as the most beautiful thing. As about something that we should be thinking day and night. And even our own Martin Luther has written that the one who knows the Commandments knows entire Scriptures. Today I want to speak about the Ten Commandments. And I want to argue that Psalmist has got it right. That they are something that every Christian can take great delight in. And that, indeed, blessed is that person who meditates upon the Commandments of the Lord day and night. Now, how do people often understand what the Commandments are? Usually they are reduced to a set of rules. Sure, they are presented as rules given by God, but still not much more than rules. Rules that we need to obey if we want to be good people in God’s eyes. Does this sound about right? Is this how people often think and teach about the Commandments? And if that’s it, if that is all that you need to know to be a good person, what can be easier than that? Everyone knows the Commandments… how many where there? Five, or six? What was the first one? Don’t steal, or don’t lie? Whatever. What if I told you that the Commandments are all about love. All about love in the Biblical sense of this word. The world today has almost lost the Biblical meaning of the word love. Today for many the word love means something like a passion, or a burning desire, or an uplifting emotion, or something like that. There is someone or something that we love, meaning – desire, covet, crave for, really want. Not so in Biblical sense. In Biblical sense love is about choice, about decision, about action, about doing certain things. For example, think about what it means that God loves us. He sees our hearts. He is the only one to see clearly the depth and ugliness of our sin. So, He looks at us and then He has that emotion… wow, I really love these guys! Of course, not. We don’t see His love expressed as an emotion or a feeling, for then He would need to destroy us – as He hates sin. But we can see His love expressed as a certain choice, as an action, as His commitment to care for us, to remain faithful to us, to provide and to protect us. Not because we are so lovable, but despite the fact, that there is so little in us to love. Now, how are then the Ten Commandments about love? We can list at least three ways. First, they teach us about God’s love towards us. Second, they teach us how to love our God, and finally, how to love our neighbours. First, how are the 10C about God’s love? If we look at the giving of the 10C, to whom and when did God give the 10C? To the Israel, when He had freed them from slavery. To the people whom He called ‘my son’ even before He had freed them from Egypt. “My son…” We may wrongly think that the 10C are given so that we can earn God’s love. Live accordingly and then God may be pleased with you, then He may love you. It is the very opposite. And we can see it with the giving of the Ten Commandments. God’s love always comes first. It is similarly as with parents. When do they begin to love their children? Do they begin to love them when they start obeying them? Or when they do their good works? Of course, not. Parents love their children from the moment of conception. And because we love them we teach them how to lead blessed lives. The same is true with our God. He doesn’t wait till His people start keeping the 10C, He loves us first and from the very beginning. He is our perfect Father is heavens. 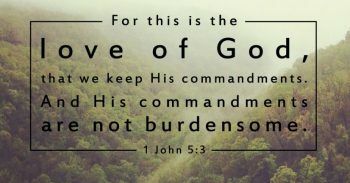 He loves us and therefore He gives us His Commandments. Do you remember what words He did use, when He gave the 10C? How did He begin? You shall?! You must?! No! He begins by giving us a gift. The greatest gift of all, by giving us Himself: “I am the LORD your God, who brought you out of the land of Egypt, out of the house of slavery.” I am the Lord your God. He gives Himself to us. We can’t even understand the greatness of these words. God, the Creator, He wants to be your God. Think about it, – He wants to be your God. Your God! Of course, the words “who brought you out of Egypt” don’t apply to us. We were never slaves in Egypt. But we all were slaves to sin. And even before our Lord taught us His will as summarized in the Ten Commandments, He brought us out of slavery to sin and death and devil. Therefore, Luther suggested that we, as God’s people living after Jesus death and resurrection, could use the Apostles Creed to summarize what kind of God gives His Commandments to us today. I am the Lord your God, I made you, I gave you your body and soul and still care of them, I richly and daily provide for you, I defend you and protect you. I have redeemed you, purchased and won you, that you may be my own and live with me in my kingdom. I have called you by the Gospel, I have enlightened you, I have kept you in the true faith. I will raise you and give you eternal life. God’s love comes first. It is abundant love. Divine love. Selfless. Self-sacrificial love. That is His love that provides us our home, the Earth and our daily bread, it is His love that sends Him to come as one of us, and that is His love that sends His Spirit into our hearts when we are still His enemies. Our God is the Greatest Lover, and He wants to teach us how to love. Once He has poured His love on us He teaches us how to respond. This is the second things. The Commandments are, we could say, God given tips how to love. How to love Him and how to share His love with our neighbours. So, how do we love God? It is very simple, when we fear, love and trust in Him above all things. When we look to Him for our happiness and security, when we allow Him to determine who we are, and what the meaning of our lives is. When we call upon Him in all troubles, pray and praise Him. When we do not despise teaching and God’s Word but hold it sacred and gladly hear and learn it. You see, it is right here, in the gathering of God’s people where we love our God, by keeping the first three commandments. It is not about feelings or emotions, it is about us choosing to be here and faithfully being here. This is how we love our God. This is how we respond to this God, who loves us first. Finally, the Commandments are about loving our neighbours. And again, it is not about feelings or emotions. We may disagree with our parents and other authorities, but we can still choose to honour them, and to serve and obey them. We may not even like our neighbours, they may not be the most pleasant people, but we can choose to help them in every physical need. The world does tempt us with different sexual temptation, but it is up to us to choose to lead sexually decent life in words and actions. Even in the best marriages there can be moments, when we don’t feel like loving our spouse, but as we are loved by our God, so we too can choose to honour and love our spouse and to care for them as God cares for us. Not because they deserve it, but because we are loved by Jesus more that we can imagine, and He wants us to share this love with others. We may want to care for our material needs more than about our neighbours’, and we usually do, but again, we can choose to help them to improve their situation and wellbeing. We may want to let our anger and disappointment out and to say what we truly think about that person, but we can choose to love them, and to speak well of them and to explain everything is the kindest way. This is what it means to love your God and your neighbour. Love is not something abstract. It has a very specific shape – it comes as the 10C. There is no loving God apart or against the Commandments. There is no loving neighbour apart or against the Commandments. The 10C give shape to our love. They guide our love. And, don’t forget they are expressions of God’s love. He wants us to have blessed life. He wants us to meditate upon His Law and love day and night. He wants us to realize that His Law and love are reviving the soul, that they are more to be desired than gold, that they are sweeter than honey. It is most certainly true. Concluding one more reminder from blessed Martin Luther. Our God, “He is an Almighty and exceedingly rich Bestower [Giver of all good gifts], who runs ahead of you with good things, even before you seek them. Before He created the first humans He furnished the earth with rich gifts for their provision. This is your God, and, indeed, He is the Greatest Lover. And you are the blessed ones that He loves. Learn His 10 tips, learn them well, and let them shape your love towards your God and towards your neighbours. Amen.